I just gave a little talk at a conference about starting from a place of empathy when we write about people who don’t share our cultural perspective. More on that later, but here’s something that I promised I would post (thank you to those who pushed me to get on this!) that I think will be helpful to a lot of people. 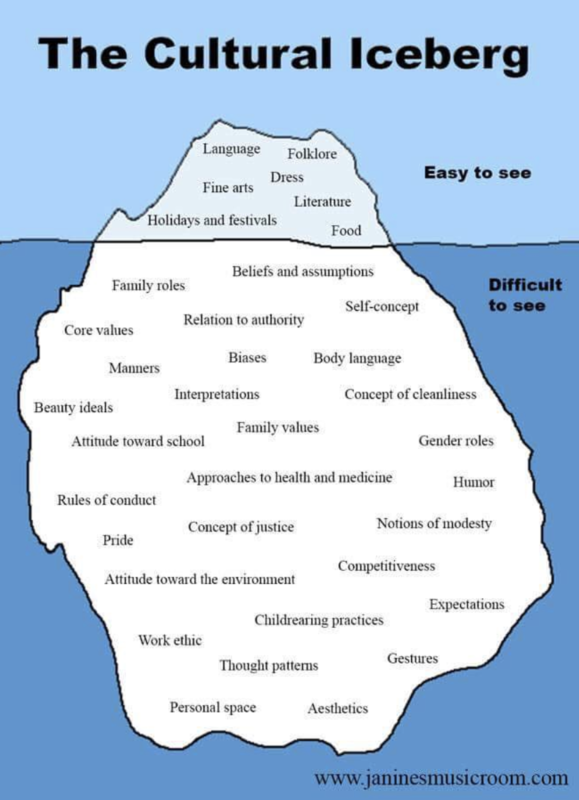 It’s a graphic created by Janine Slaga that shows culture as an iceberg. It’s about the visible and invisible (or above and below the surface, if you will) aspects of culture. Isn’t it amazing? Most of us, when we write “outside our lanes,” rely on the stuff at the tip of the iceberg. Our characters eat the food, speak the language*, celebrate the holidays. Maybe we dip into some of the family roles or the manners. But for a truly nuanced, fully realized character—especially a main character—we should be familiar with so much more. We should have carefully considered all of that good stuff beneath the surface. If we haven’t, then we need to do more work. If you like this image, you might like the other stuff that Janine has created. Support Janine here. *If you’re writing a Black character and thinking, “Yes, I will have that character speak “Black” to make them more authentic,” please think again. Black English Vernacular is a complex, complete language with its own specific rules about grammar, syntax, and subtext. Dropping a few g’s off of “ing” words, experimenting with “ain’t” and double negatives, shifting around the “be” verb, using slang…is not equivalent to BEV and will not make your Black character authentic. A caveat. If the criticism is leveled at something that is patently, empirically untrue, sure. By all means, go for it. Defend your honor and let your people defend your honor. But if it’s leveled at something less clearly defined, like racism or ableism, tell your people to stand down. When someone calls out your book for being racist or having racist elements, it can feel like a personal attack. And—not gonna lie—your fears are well-founded. People often do read criticisms of racist depictions in books and leap to the conclusion that the author is racist, as well. WHICH IS A LIE, your friends will want to shout, SO EFF OFF WITH YOUR MEAN AND BASELESS ACCUSATIONS. And you may be tempted to let them, because you feel unfairly attacked. But for all the reasons I’ve listed in Parts I and II of What to Do When Your Book Gets Called Out for Being Problematic, please consider the possibility that your defenders may need to re-examine your book from the point of view of the critics. Remember that you don’t have to be a white supremacist or to have unexamined racist assumptions and attitudes. If your friends go on the attack on your behalf, no one comes out looking better. Your honor will not be restored. They’ll just look like they’re gaslighting, and you’ll all look bad. Instead, ask for behind-the-scenes support. Talk through what’s happened, take a look at the elements that have been criticized. Maybe have them help you research the issues, or ask them to reach out on your behalf so that you can better understand the criticism, always remembering that the critics themselves don’t owe you anything. Criticism hurts, especially when it’s angry, and it’s hard to watch our loved ones suffer. It’s natural and good to want to do something to ease the suffering. Just remember that facilitating a slow, careful recovery is often more productive than a quick, angry counterattack. Not mine, but this guy on YouTube. Tons of books by Asian authors are releasing this month. One of them is mine! It's Not Like It's A Secret comes out on Tuesday, May 9. One winner will receive five books. 4 amazing contemporary young adult books by Asian American authors that release this month: Noteworthy by Riley Redgate, I Believe in a Thing Called Love by Maurene Goo, Always and Forever, Lara Jean by Jenny Han, and When Dimple Met Rishi by Sandhya Menon.